After Ag capture and exposure to danger stimuli, maturing dendritic cells (DCs) migrate to regional lymph nodes, where antigenic peptides are presented to T lymphocytes. To migrate from peripheral tissue such as the epidermis to regional lymph nodes, Ag-bearing epidermal Langerhans cells must move through an extracellular matrix (ECM) of various compositions. The nature of their capacity to transmigrate via ECM is not well understood, although MIP-3β and CCR7 play critical roles. We were interested in verifying whether heparanase, a heparan sulfate-degrading endo-β-d-glucuronidase that participates in ECM degradation and remodeling, is expressed and functional in monocyte-derived DCs. Using immunohistochemistry, confocal microscopy, RT-PCR, Western blot analysis, assays for heparanase activity, and Matrigel transmigration, we show that heparanase is expressed in both nuclei and cytoplasm of immature DCs, and that gene expression and synthesis take place mainly in monocytes and early immature DCs. We also found that both nuclear and cytoplasm fractions show heparanase activity, and upon LPS-induced maturation, heparanase translocates to the cell surface and degrades ECM heparan sulfate. Matrigel transmigration assays showed a MIP-3β-comparable role for heparanase. Because heparan sulfate glycosaminoglycans play a key role in the self-assembly, insolubility, and barrier properties of the ECM, the results of this study suggest that heparanase is a key enzyme in DC transmigration through the ECM. Dendritic cells (DCs)3 are APCs with the unique ability to initiate an immune response (1). Immature DCs (iDCs) are localized in peripheral tissues, where they serve as sentinels for incoming Ags. After Ag capture and upon exposure to danger stimuli, iDCs undergo maturation and migrate to regional lymph nodes, where antigenic peptides are presented to T lymphocytes. Thus, their functioning as APCs involves localization in tissues and trafficking via the lymph vessels or blood to lymphoid organs. MIP-3β and CCR7 were shown to play a critical role in migration via blood and lymph nodes (2). However, to migrate from peripheral tissue such as the epidermis to regional lymph nodes, Ag-bearing epidermal Langerhans cells must move through an extracellular matrix (ECM) of various compositions. The nature of their capacity to transmigrate via the ECM, which is only partially understood, is affected by matrix metalloproteinases (MMPs) and MMP inhibitors, as well as PGE2 and other inducers of MMP inhibitors (3, 4, 5). We wanted to verify whether heparanase, a heparan sulfate-degrading endoglycosidase that participates in ECM degradation and remodeling, is expressed and functional in monocyte-derived DCs. Heparanase is an endo-β-d-glucuronidase capable of cleaving heparan sulfate side chains at a limited number of sites, yielding heparan sulfate fragments (6, 7, 8). Heparanase activity has been correlated with the metastatic potential of tumor-derived cells that facilitate cell invasion as well as with angiogenesis, autoimmunity, and inflammation (7, 9, 10, 11, 12). Heparanase release by degranulation has been implicated in diapedesis and extravasation of a number of immune cells, including neutrophils, macrophages, and lymphocytes (9, 13, 14, 15). However, its role in DC migration is unknown. Immature monocyte-derived DCs were generated from the CD14+ fraction of PBMCs. Briefly, PBMCs were isolated using Ficoll, as described previously (16), and anti-CD14 magnetic beads were used according to the manufacturer’s instructions to isolate monocytes from PBMCs (Miltenyi Biotec). Monocytes were placed in the wells at a concentration of 1.25 × 106/1.5 ml RPMI 1640 medium (Invitrogen Life Technologies) in the presence of 1% autologous plasma, GM-CSF, and IL-4 (1000 U/ml; PeproTech). Every 2 days, 0.15 ml was removed, and 0.25 ml of a medium containing plasma, IL-4, and GM-CSF was added. By day 6, >90% of the cells were CD14−, with low expression of DR and CD86. LPS (10 ng/ml) was used to induce mature DCs (mDCs) in all experiments unless indicated otherwise. Monoclonal mouse anti-human heparanase Ab (mAb130) was used for Western blotting and flow cytometric analysis. This Ab, which recognizes both latent 65-kDa and processed 50-kDa heparanase enzymes, was provided by InSight Biopharmaceuticals (11). Polyclonal rabbit anti-human heparanase Ab (Ab733) was used for immunohistochemistry and indirect immunofluorescence with confocal and fluorescent microscopy. It was raised against a peptide (KKFKNSTYSRSSVDC) located in the 50-kDa active human heparanase enzyme (17). Monoclonal mouse anti-β-actin (Sigma-Aldrich) was used for Western blotting. Cultures of bovine corneal endothelial cells were established from steer eyes and maintained in DMEM (1 g glucose/L) supplemented with 5% newborn calf serum, 10% FCS, and 1 ng/ml basic fibroblast growth factor (18). Bovine corneal endothelial cells were plated into 35-mm tissue culture dishes and cultured as described above, except that 4% dextran T-40 was included in the growth medium (18, 19). Na235SO4 (25 μCi/ml; Amersham Biosciences) was added on days 2 and 5 after seeding. On day 12, the subendothelial ECM was exposed by dissolving the cell layer with PBS containing 0.5% Triton X-100 and 20 mM NH4OH and washing four times with PBS (19). The ECM remained intact, free of cellular debris, and firmly attached to the entire area of the tissue culture dish. Nearly 80% of the ECM radioactivity was incorporated into heparan sulfate glycosaminoglycans. For separations of nuclear and cytoplasmic fractions (20), pellets of the cells (4 × 106 cells) were incubated with a 100-μl buffer solution (10 mM PIPES, 0.1 M NaCl, 2 mM MgCl2, and 0.1% Triton X-100 in H2O) for 30 min at 4°C. Two phases appeared. Nuclei were contained in the lower fraction, and cytoplasm was contained in the upper fraction. The cytoplasm fraction was removed and diluted to 0.9 ml of RPMI 1640 medium. The nuclear fraction was washed in PBS, centrifuged at 14,000 rpm for 5 min at 4°C, and resuspended in 0.9 ml of RPMI 1640 medium. Both nuclear and cytoplasmic fractions were lysed by three cycles of freezing and thawing, and incubated (4 h, 37°C; pH 5.8) on 35S-labeled ECM with 150 μl of heparanase reaction solution (0.15 M NaCl, 20 mM phosphate-citrate buffer (pH 5.8), 1 mM DTT, and 1 mM CaCl2). To determine heparanase activity in whole cell lysates, cells were lysed by three cycles of freezing and thawing and incubated on 35S-labeled ECM with 150 μl of heparanase reaction solution as described above. The incubation medium was centrifuged, and the supernatant containing sulfate-labeled degradation fragments was analyzed by gel filtration on a Sepharose CL-6B column (0.9 × 30 cm). Fractions (0.2 ml) were eluted with PBS, and their radioactivity was counted in a beta scintillation counter (11, 19). Degradation fragments of heparan sulfate side chains were eluted from Sepharose 6B at 0.5 < Kav < 0.8 (fractions 15–30, peak II). Nearly intact heparan sulfate glycosaminoglycans were eluted at Kav < 0.2 (fractions 1–10, peak I) (11, 19). Each experiment was performed at least three times, and the variations in elution positions (Kav values) did not exceed 15%. To determine heparanase activity in intact cells, 3 × 106 cells were resuspended in 0.9 ml of RPMI 1640 medium and incubated on 35S-labeled ECM with 150 μl of heparanase reaction solution (buffer phosphate-phosphate (pH 6.2)) for 24 h at 37°C in the absence or the presence of LPS (1 ng/ml). The medium containing sulfate-labeled degradation fragments was analyzed by gel filtration on a Sepharose CL-6B column (0.9 × 30 cm) as described above. We used immobilized, sulfate-labeled ECM as a substrate, because it resembles the natural substrate degraded by the cells in vivo better than soluble heparin sulfate. Under this condition, decreased heparanase activity (i.e., lesser amount of sulfate-labeled material eluted in peak II (fractions 15–30; 4–10 kDa)) is not associated with an increase in the first peak (peak I), which corresponds to nondegraded heparan sulfate (molecular mass, >0.4 × 106 kDa) or proteolytic activity not related to heparanase. This is because the nondegraded, high molecular mass material remains bound to the dish and hence is not subjected to gel filtration analysis. Cells were put on slides by cytospin (5 min, 1000 rpm), fixed with 95% ethanol and 5% acetic acid (5 min, −20°C), and washed in PBS (2 min, three times). Permeabilization of the cells was performed by incubation with buffer (20 mM HEPES, 300 mM sucrose, 50 mM NaCl, 3 mM MgCl2, and 0.5% Triton X-100) for 4 min on ice. Cells were then washed with PBS (2 min, three times). Endogenous peroxidases were blocked by incubation with 3% H2O2 in 100% methanol for 15 min at room temperature and washed with PBS (2 min, three times). After incubation with blocking solution (Histostain-Plus kit; Zymed Laboratories) for 10 min at room temperature, the cells were incubated overnight with either Ab733 (diluted 1/200 in PBS) or control rabbit serum at 4°C in a humidified chamber. Then cells were washed in PBS, incubated with secondary biotinylated Ab (Histostain-Plus kit; Zymed Laboratories) for 10 min at room temperature, washed in PBS, incubated for 10 min at room temperature with enzyme conjugate (Histostain-Plus kit; Zymed Laboratories), and again washed in PBS. Color was developed using a calorimetric reaction with the 3-amino-9-ethyl-carbazole substrate kit for 5 min in the dark (Histostain-Plus kit; Zymed Laboratories), and cells were counterstained with Mayer’s hematoxylin. Cells were put on the slide by cytospin (5 min, 1000 rpm), fixed with 4% paraformaldehyde (10 min, room temperature), and washed with PBS (2 min, three times). Permeabilization of the cells was performed by incubation with buffer (20 mM HEPES, 300 mM sucrose, 50 mM NaCl, 3 mM MgCl2, and 0.5% Triton X-100) for 4 min on ice. Cells were then washed with PBS (2 min, three times). Intrinsic fluorescence was blocked with 50 mM NH4Cl (10 min, room temperature). After washes in PBS (2 min, three times), the cells were incubated with blocking solution (10% goat serum in PBS, 10 min, room temperature), followed by incubation (overnight, 4°C) with anti-heparanase Ab (Ab733 diluted 1/200 in PBS) or control rabbit serum. After washes with PBS (2 min, three times), cells were incubated with secondary Cy2-conjugated goat anti-rabbit antiserum (1 h, room temperature, in the dark) and washed in PBS (2 min, three times). The nuclei were stained with propidium iodide (0.5 μg/ml, 5 min, room temperature) and washed in PBS (2 min, three times). RNA was isolated using the RNeasy Mini Handbook (Qiagen) according to the manufacturer’s instructions, and was quantified by UV absorption. After reverse transcription of 1 μg of total RNA by oligo(dT) priming, the resulting single-strand cDNA was amplified using TaqDNA polymerase (Promega) and specific primers directed against human heparanase (4U, 5′-ACA GTT CTA ATG CTC AGT TGC TC-3′; 4L, 5′-AAA GAC GGC TAA GAT GCT GAA G-3′). PCR conditions were initial denaturation at 95°C for 2 min, denaturation at 96°C for 18 s, annealing for 80 s at 58°C, and extension for 70 s at 72°C (33 cycles). Aliquots (10 μl) of the amplified cDNA were separated by 1.5% agarose gel electrophoresis, visualized by ethidium bromide staining, and compared with the expression level of a ribosomal L-19 gene (L-19U, 5′-ATG CCA ACT CTC GTC AAC AG-3′; L-19L, 5′-GCG CTT TCG TGC TTC CTT-3′) (11, 21). Only RNA samples that gave completely negative results in PCR without reverse transcriptase were further analyzed. For immunoblot analysis, aliquots of 10 × 106 cell lysate were mixed with heparin-Sepharose Fast Flow Beads (Amersham Biosciences). The beads were then washed with PBS (three times) and boiled in Laemmli buffer. Proteins were separated by electrophoresis in 10% SDS-PAGE and transferred to an Immobilon-P membrane (Millipore). Heparanase was detected by monoclonal mouse anti-human heparanase Ab (mAb130) (11, 22), followed by HRP-conjugated anti-mouse Ab (The Jackson Laboratory), and was enhanced by chemiluminescence (Pierce) according to the manufacturer’s instructions (11, 23). Fuji Super RX medical x-ray film was used. Levels of a constitutively expressed protein β-actin were evaluated by a monoclonal mouse anti-β-actin Ab (diluted 1/1000), followed by HRP-conjugated anti-mouse Ab (The Jackson Laboratory). DCs were stained with primary monoclonal mouse anti-human heparanase Ab (mAb130; 5 μg/sample) or isotype control mouse IgG2b, then washed and stained with secondary PE-conjugated anti-mouse IgG Ab. Intracellular staining of DCs was performed with Leucoperm (Serotec) according to the manufacturer’s instructions. Flow cytometry was performed on a FACScan flow cytometer (BD Biosciences), and data were analyzed using CellQuest analysis software (BD Biosciences). Transwell inserts (6.5 mm) fitted with polycarbonate filters (5-μm pore size) (Corning Costar) were used. The upper surface of the filter was coated with 15 μg of Matrigel (Collaborative Biomedical Products), solubilized in 50 μl of double distilled water, and air-dried for 1.5 h in a hood. The lower compartment was filled with 600 μl of RPMI 1640 medium supplemented in some experiments with 200 ng/ml MIP-3β. DCs (50,000 cells/100 μl of RPMI 1640 medium) were then added to the upper compartment. The chambers were incubated at 37°C in 5% CO2 for 22 h. Medium was collected from the lower compartment of the chamber, and the cells were counted by flow cytometry for 60 s. The percentage of transmigrating DCs was calculated by acquisition of events for 60 s at a constant flow rate of 60 μl/min using CellQuest software (BD Biosciences). This showed the number of transmigrating DCs in 60 μl, and the total number of transmigrating DCs was calculated according to the lower compartment volume. The percentage of transmigrating DCs was calculated according to the initial loading of DCs in the upper chamber (50,000). Every experiment was performed in duplicate and was repeated at least three times. Heparin (100 μg/ml) was used to evaluate the effect of heparanase inhibition on transmigration. For an additional method of evaluation of inhibition, we added CytoCount beads (DakoCytomation) in some experiments. An equal volume containing 40 μl of CytoCount beads was added by reverse pipetting to the collected volume of the lower chambers, including transmigrated DCs. CytoCount beads are easily distinguished from cells in the plot of side and forward scatter, and the acquisition stopped when 2000 beads were counted. Results in these transmigration assays are presented as a number relative to 2000 beads and not as a percentage of input. Every experiment was performed in duplicate. Experiments were repeated at least three times. 100NA,RO.H, which is a 25% glycol-split (RO), 100% N-acetylated heparin (5 μg/ml), was used to evaluate the effect of heparanase inhibition on transmigration. 100NA,RO.H is a nonanticoagulant, chemically modified heparin that was found to be a specific heparanase inhibitor (24); it was provided by Dr. C. Pisano (Sigma-Tau, Pomezia, Rome, Italy) and Prof. B. Casu (Ronzoni Institute, Milan, Italy). Student’s t test was used to test for significance in Matrigel transmigration assay experiments. Monocytes and DCs were stained on days 0–8 with polyclonal rabbit anti-human heparanase Ab (Ab733). In monocytes (days 0 and 1), heparanase was localized mainly in the nuclei, but upon differentiation to iDCs (days 2–6), heparanase was detected in both nuclei and cytoplasm (Fig. 1⇓A). On days 4–6, iDCs expressed heparanase mainly in the nucleus, perinucleus, and cytoplasm. When maturation was triggered with 10 ng/ml LPS (days 7–8), heparanase appeared in the mDC membrane and was concentrated in membrane extensions, possibly to allow ECM transmigration (Fig. 1⇓A). A similar pattern was observed using indirect immunofluorescence and confocal microscopy (Fig. 1⇓B). The results from flow cytometric staining confirmed results from intracellular staining (Fig. 1⇓C). Heparanase is expressed in monocyte-derived DCs. 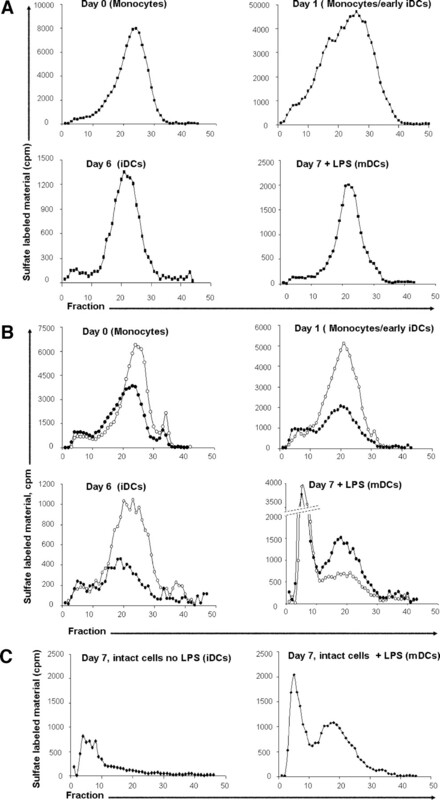 Monocytes and differentiating DCs are presented according to days in culture. 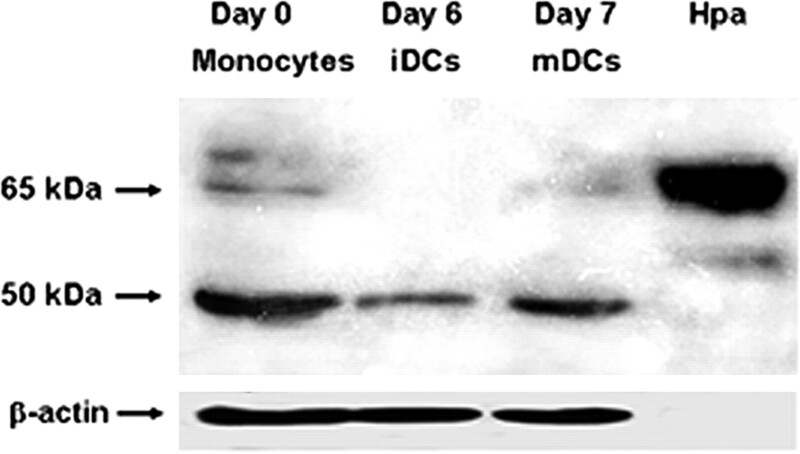 Days 0–1 represent monocytes, days 2–5 represent iDCs, and days 7–8 with LPS represent mDCs. A, Heparanase is expressed in monocyte nuclei and in the nuclei, cytoplasm, and membranes of DCs, as shown by immunohistochemistry of DCs using polyclonal rabbit anti-human heparanase Ab. Rabbit serum, shown in the upper portion of mDCs (day 7 with LPS), was used as a staining control (zoom, ×40). B, A similar pattern is shown by confocal microscopy using indirect immunofluorescence (zoom, ×40), using primary polyclonal rabbit anti-human heparanase Abs, followed by a secondary Cy2-conjugated goat anti-rabbit antiserum (green) and propidium iodide nuclear staining (red). Figures contain optically merged, double-labeled DCs (yellow). C, Flow cytometric analysis of heparanase staining in DCs. The iDCs and mDCs were stained for heparanase (bold lines) or with isotype control (black lines). Both iDCs and mDCs expressed high levels of intracellular heparanase (left). Western blot analysis using monoclonal mouse anti-human heparanase Ab (mAb130) revealed the presence of endogenous heparanase protein in monocytes, iDCs, and mDCs. In monocytes, both the latent 65-kDa proenzyme and the active 50-kDa heparanase were identified. iDCs and mDCs expressed primarily the 50-kDa active form of the enzyme (Fig. 2⇓). Western blot analysis with monoclonal mouse anti-β-actin Ab was used as a control for equal protein loading. Proheparanase and active heparanase are present in monocyte-derived DCs. The presence of 65- and 50-kDa heparanase proteins in monocytes, iDCs, and mDCs is shown. Cell lysates (10 × 106) of monocytes (day 0, lane 1), iDCs (day 6, lane 2), and mDCs (day 7 with LPS, lane 3) were assessed by Western blot analysis using anti-heparanase mAb130 and anti-β-actin Abs. Lane 4 represents a purified 65-kDa heparanase (Hpa) as a positive control. To further elucidate the mode of heparanase generation in DCs, we applied RT-PCR to evaluate heparanase gene expression in monocytes, iDCs, and mDCs. Fig. 3⇓ shows the presence of heparanase mRNA mainly in monocytes (days 0 and 1). There was no significant expression of heparanase-RNA in iDCs (days 2–6) or mDCs (day 7). We therefore concluded that although the heparanase protein is present in both monocytes and iDCs, heparanase gene expression and synthesis take place mainly in monocytes and perhaps in the very early steps of differentiation toward iDCs. Heparanase is synthesized in monocytes and during early stages of DC differentiation. RNA was extracted from monocyte-derived DCs during different stages of differentiation. Primers specific for heparanase were used for RT-PCR (see Materials and Methods). Monocytes (days 0–1), early iDCs (days 2–3), iDCs (days 4–6), and mDCs (day 7) are shown. Control (no primers of heparanase) and Hpa, a plasmid control of heparanase, are indicated. L-19 is shown for comparison. The data shown are representative of five experiments. To verify heparanase activity, lysates of 4 × 106 monocytes, iDCs, and mDCs were prepared by three cycles of freezing and thawing, followed by incubation (4 h, 37°C; pH 5.8) with sulfate-labeled ECM. The incubation medium was then analyzed by gel filtration on a Sepharose CL-6B column, as described in Materials and Methods. Low molecular mass labeled degradation fragments eluted toward the total volume of the column (peak II; fractions 15–30; 0.5 < Kav < 0.75) were previously shown to be fragments of HS, because they were 1) 5- to 6-fold smaller than intact heparan sulfate side chains, 2) resistant to further digestion with papain and chondroitinase avidin-biotin peroxidase complex, and 3) susceptible to deamination by nitrous acid (19). In contrast, sulfate-labeled material released from ECM by proteolytic enzymes or nondegraded heparan sulfate was of much higher molecular mass and eluted next to the void volume (peak I; fractions 2–8) (19). As demonstrated in Fig. 4⇓A, heparanase was highly active in monocytes (days 0–1), iDCs (days 5–6), and mDCs (day 7; with 10 ng/ml LPS). To identify the sites of activity, nuclei and cytoplasm of 4 × 106 cells were separated by incubation with buffer containing Triton X-100 for 30 min in ice (see Materials and Methods). The nuclei and cytoplasm fractions were lysed by three cycles of freezing and thawing. After incubation (4 h, 37°C; pH 5.8) on 35S-labeled ECM, the reaction medium was analyzed by gel filtration on a Sepharose CL-6B column as described in Materials and Methods. As shown in Fig. 4⇓B, heparanase activity in monocytes (days 0–1) was 2- to 3-fold higher in cell nuclei than in cytoplasm. Similarly, heparanase activity was mainly expressed in the nuclei of iDCs (day 6), whereas activity was low in the cytoplasm (Fig. 4⇓B). 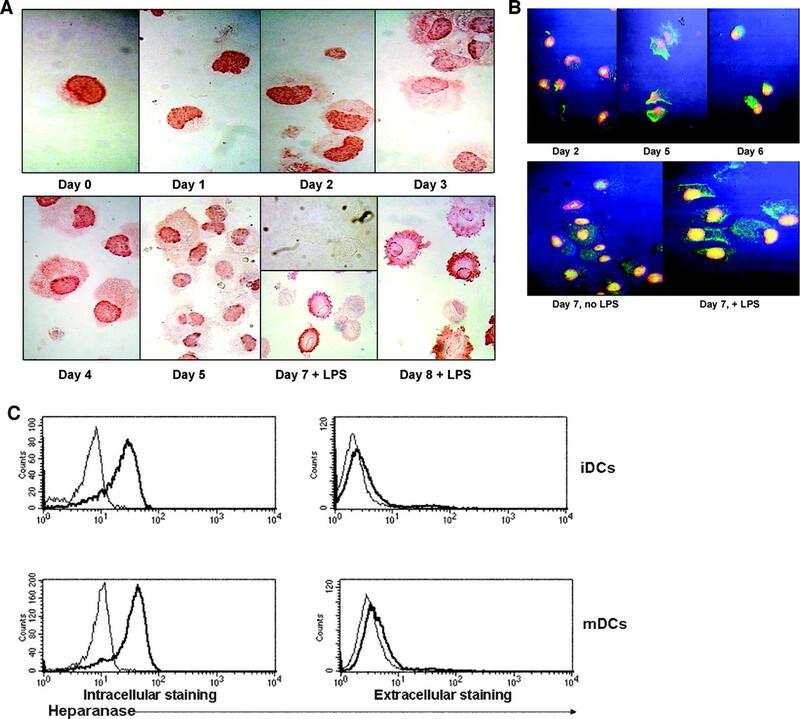 In contrast, mDCs (day 7, with LPS), showed greater heparanase activity in the cytoplasm (Fig. 4⇓B). Active heparanase, present in both cytoplasm and nuclei of DCs, translocates to the membrane of mDCs. A, Lysates from monocytes on day 0 (upper left) and monocytes/early iDCs on day 1 (upper right) show heparanase activity in 15–35 fractions as indicated by peak II (11 ,19 ). Lysates from iDCs (day 6, lower left) and mDCs (day 7 with LPS, lower right) show similar heparanase activity. Heparanase activity in cell lysates was determined by incubating lysates for 4 h with a 35S-labeled ECM. The 35S-labeled degradation fragments released into the incubation medium were analyzed by gel filtration (for details, see Materials and Methods). B, Nuclear (○) and cytoplasm (•) activity of heparanase was determined in monocytes (day 0), monocytes/early iDCs (day 1), iDCs (day 6), and mDCs (day 7 with LPS). C, Intact iDCs that showed no heparanase activity (left) expressed heparanase activity upon maturation (fractions 15–30; right). Cells (5 × 106) were incubated overnight in contact with sulfate-labeled ECM with or without 1 ng/ml LPS. Interestingly, intact iDCs incubated on 35S-labeled ECM did not show heparanase activity, as indicated by the lack of labeled heparan sulfate degradation fragments eluted in fractions 15–30 (Fig. 4⇑C, left). However, upon coincubation with 1 ng/ml LPS and despite the lack of clear extracellular staining using flow cytometry, heparanase activity was documented in intact mDCs (Fig. 4⇑C, right). No increased apoptosis or increased cell lysis was seen after 1 ng/ml LPS, and heparanase activity was not detected in the culture medium of iDCs or mDCs (data not shown). Thus, we conclude that the observed heparanase activity was not due to cell death or leakage with the loss of membrane integrity (data not shown). These findings together with heparanase immunostaining results showing membrane and pseudopod heparanase localization upon maturation suggest that active heparanase translocates from the cytoplasm to the cell membrane upon maturation. Previous studies showed cell surface expression and secretion of heparanase promote cell transmigration in vitro through a reconstituted basement membrane (Matrigel) (15, 21). The main function of mDCs is presentation of Ags to naive T cells that are present in a remote area, the T cell zone in the lymph nodes. To migrate via lymph drainage and reach the T cell zone in draining lymph nodes, mDCs must transmigrate the ECM. We used the Matrigel transmigration assay to examine the involvement of heparanase in ECM transmigration. As demonstrated in Fig. 5⇓A, 12.24 ± 2.12% of the mDCs transmigrated the Matrigel layer within 22 h at 37°C in the presence of MIP-3β. In the absence of chemoattractant, the rate of transmigration was 3.66 ± 0.98%. Cell transmigration was reduced by 53% (range, 35–66%) in the presence of heparin (p < 0.001), a potent competitive inhibitor of heparanase activity (25, 26). Transmigration in the presence of heparin and chemoattractant was 7.65 ± 1%. Because heparin is not a specific inhibitor and could possibly interfere with the formation of CCL19 gradient or with the function of adhesion molecules, we used a more specific inhibitor, 100NA,RO.H (24). CytoCount beads were used for evaluation of the rate of inhibition in transmigrating DCs. As shown in Fig. 5⇓B, in the presence of 100NA,RO.H, transmigration of mDCs was reduced to 35% (p < 0.001).These results suggest an active MIP-3β-comparable role for heparanase in mDC transmigration of the ECM. Heparanase and MIP-3β are required for efficient transmigration of ECM. DCs (0.05 × 106 cells/100 μl) were incubated in Transwells coated with Matrigel (15 μg/50 μl double distilled water) for 22 h at 37°C. A, The mDCs were incubated with lower chamber medium containing RPMI 1640 medium (columns 1–3) and 200 ng/ml MIP-3β (columns 2 and 3). Heparin (100 μg/ml; column 3) was added to the upper chamber before the incubation. Data are representative of five experiments with a range of heparin inhibition of 35–66%. B, The iDCs and mDCs were incubated with lower chamber medium containing RPMI 1640 medium (columns 1–6), and 200 ng/ml MIP-3β (columns 2, 3, 5, and 6). 100NA,RO.H (5 μg/ml) was added in the upper chamber prior the incubation (columns 3 and 6). CytoCount beads were added to the collected lower chamber media, and acquisition was stopped when 2000 beads were counted. 100NA,RO.H reduced transmigration by 35% (p < 0.001). Results in these transmigration assays are presented as the cell number relative to 2000 beads acquired. Through degradation of heparan sulfate, heparanase has been shown to facilitate ECM invasion by metastatic cancer cells as well as passage of immune cells such as macrophages (15) and lymphocytes (27, 28) into their target tissues. The present results indicate that heparanase is synthesized by monocytes and early iDCs, and that the preformed protein remains active in iDCs and mDCs, in agreement with the rather long half-life of heparanase (29). Heparanase is retained in an active form, as revealed by the presence of 50-kDa fragments. Its ability to degrade heparan sulfate in intact ECM and to promote cell transmigration through a reconstituted basement membrane is thus preserved. Interestingly, upon DC maturation, heparanase accumulates in membrane extensions, most likely to allow ECM degradation. This was supported by the ability of intact viable mDCs, but not iDCs, to degrade ECM heparan sulfate. Alternatively, membrane accumulation may precede degranulation, as shown for platelets, neutrophils, and mast cells (9, 30). Our results indicate that LPS promotes translocation of heparanase from the cytoplasm to the cell surface and membrane extensions. In this study it can degrade extracellular heparan sulfate and thus facilitate DC migration and influence DC phenotype. Immunostaining revealed similar pericellular distribution of heparanase in PMA-treated, but not untreated, human promonocytic cells (15). Moreover, addition of a chemoattractant FMLP induced heparanase redistribution at the leading edge of migration, and neutralizing anti-heparanase Abs significantly inhibited transmigration of PMA-treated cells (15). These results support the idea that translocation of cytoplasmic heparanase to the cell surface is involved in the migratory activity of mDCs, and the presence of heparanase in Langerhans cells supports the relevance of these findings in vivo (31). Heparan sulfate proteoglycans are ubiquitous macromolecules associated with the surface and ECM of a wide range of vertebrate and invertebrate tissue cells. Their basic structure consists of a protein core, to which several linear heparan sulfate chains are covalently O-linked. Heparan sulfate binds to and assembles ECM proteins, thus playing important roles in cell-cell and cell-ECM interactions. Moreover, the heparan sulfate chains, unique in their ability to interact with a multitude of proteins, ensure that a wide variety of bioactive molecules (e.g., heparin-binding growth factors, cytokines, chemokines, lipoproteins, and enzymes) bind to the cell surface and ECM, and thereby function in the control of diverse normal and pathological processes. Heparan sulfate glycosaminoglycans play a key role in the self-assembly, insolubility, and barrier properties of the ECM. Cleavage of heparan sulfate, therefore, affects tissue integrity and, hence, normal and pathological phenomena involving cell migration and responses to changes in the ECM. Despite previous reports on the existence of several distinct mammalian heparan sulfate-degrading endoglycosidases (heparanases), cloning of the same gene (Hpa-1), first in our laboratory (11) and then by several other groups, suggests that mammalian cells primarily express a single dominant functional heparanase. The heparanase cDNA encodes for a 543-aa protein that undergoes proteolytic processing at two potential cleavage sites, Glu109-Ser110 and Gln157-Lys158, yielding an 8-kDa polypeptide at the N terminus and a 50-kDa polypeptide at the C terminus, which heterodimerize to form an active heparanase enzyme (32, 33). Migrating DCs in different stages of maturation after Ag uptake enter the lymphatic circulation, where secondary lymphoid tissue chemokine (SLC/CCL21) and MIP-3-β/CCL19, acting via up-regulated CCR7, have crucial roles (34, 35, 36, 37). However, to reach the lymphatics, migrating DCs need to interact with, degrade, and transmigrate the ECM, where in vitro studies have suggested that β1 integrins may play a role (38). Upon transmigration, factors released from the ECM (28) may interact with DCs and influence their stimulatory capacity. Enzymes suggested to be involved in ECM degradation and transmigration include proteinases, such as elastases, cathepsins, and MMPs, as well as urokinase plasminogen activator, which converts plasminogen to plasmin. Plasmin degrades various ECM components, such as fibronectin, and activates MMPs. Human leukocyte elastase degrades ECM components, such as elastin, fibronectin, and collagen, and cleaves inflammatory mediators, such as IL-2, TNF-α, IL-8, and IL-1β. Members of the MMP family cleave all ECM components as well as inflammatory mediators, such as TNF-α, IL-1β, and TGF-α, and membrane molecules, such as IL-6, CD44, and L-selectin (28). Heparanase localization in the cytoplasm and its accumulation near membrane extensions of mDCs are consistent with a role in transmigration. However, it is not clear what part heparanase plays in the nucleus. Recently, heparanase was found in the nucleus of human oral squamous cell carcinoma, MDA-MB-435 breast carcinoma, and U87 human glioma cells transfected with the full-length human heparanase cDNA (39). The latter cells predominantly expressed 50-kDa active heparanase in their nuclei. Moreover, it was demonstrated that nuclear heparanase is capable of degrading both nuclear and ECM-derived heparan sulfate. It was suggested that heparanase is translocated into the cell nucleus, where it degrades the nuclear heparan sulfate and may affect gene expression and other nuclear functions that are thought to be regulated by heparan sulfate. Heparan sulfate expressed in the nuclei of mammalian cells was suggested to play a role in the regulation of cell proliferation and survival. A significant relationship was recently found between nuclear heparanase expression and differentiation, but not proliferation, of esophageal cancer cells (40). In summary, active heparanase was found in the nuclei and cytoplasm of DCs and localizes in the membrane extension upon maturation, enabling intact mDCs to degrade ECM to allow transmigration. Other potential roles, including heparanase’s role in the nucleus, are yet to be elucidated. We thank Shifra Fraifeld for her assistance with the preparation of this article. ↵1 This work was supported by Hadassah-Hebrew University (to D.M.). ↵3 Abbreviations used in this paper: DC, dendritic cell; ECM, extracellular matrix; iDC, immature DC; mDC, maturing DC; MMP, matrix metalloproteinase. Sozzani, S., P. Allavena, A. Vecchi, A. Mantovani. 2000. Chemokines and dendritic cell traffic. J. Clin. Immunol. 20: 151-160. Baratelli, F. E., N. Heuze-Vourc’h, K. Krysan, M. Dohadwala, K. Riedl, S. Sharma, S. M. Dubinett. 2004. Prostaglandin E2-dependent enhancement of tissue inhibitors of metalloproteinases-1 production limits dendritic cell migration through extracellular matrix. J. Immunol. 173: 5458-5466. Randolph, G. J., G. Sanchez-Schmitz, V. Angeli. 2005. Factors and signals that govern the migration of dendritic cells via lymphatics: recent advances. Springer Semin. Immunopathol. 26: 273-287. Ratzinger, G., P. Stoitzner, S. Ebner, M. B. Lutz, G. T. Layton, C. Rainer, R. M. Senior, J. M. Shipley, P. Fritsch, G. Schuler, et al 2002. Matrix metalloproteinases 9 and 2 are necessary for the migration of Langerhans cells and dermal dendritic cells from human and murine skin. J. Immunol. 168: 4361-4371. Freeman, C., C. R. Parish. 1998. Human platelet heparanase: purification, characterization and catalytic activity. Biochem. J. 330: 1341-1350. Parish, C. R., C. Freeman, M. D. Hulett. 2001. Heparanase: a key enzyme involved in cell invasion. Biochim. Biophys. Acta 1471: M99-108. Vlodavsky, I., Y. Friedmann. 2001. Molecular properties and involvement of heparanase in cancer metastasis and angiogenesis. J. Clin. Invest. 108: 341-347. Vlodavsky, I., A. Eldor, A. Haimovitz-Friedman, Y. Matzner, R. Ishai-Michaeli, O. Lider, Y. Naparstek, I. R. Cohen, Z. Fuks. 1992. Expression of heparanase by platelets and circulating cells of the immune system: possible involvement in diapedesis and extravasation. Invasion Metastasis 12: 112-127. Nakajima, M., T. Irimura, G. L. Nicolson. 1988. Heparanases and tumor metastasis. J. Cell. Biochem. 36: 157-167. Vlodavsky, I., Y. Friedmann, M. Elkin, H. Aingorn, R. Atzmon, R. Ishai-Michaeli, M. Bitan, O. Pappo, T. Peretz, I. Michal, et al 1999. Mammalian heparanase: gene cloning, expression and function in tumor progression and metastasis. Nat. Med. 5: 793-802. Dempsey, L. A., G. J. Brunn, J. L. Platt. 2000. Heparanase, a potential regulator of cell-matrix interactions. Trends Biochem. Sci. 25: 349-351. Bartlett, M. R., P. A. Underwood, C. R. Parish. 1995. Comparative analysis of the ability of leucocytes, endothelial cells and platelets to degrade the subendothelial basement membrane: evidence for cytokine dependence and detection of a novel sulfatase. Immunol. Cell Biol. 73: 113-124. Parish, C. R., E. J. Hindmarsh, M. R. Bartlett, M. A. Staykova, W. B. Cowden, D. O. Willenborg. 1998. Treatment of central nervous system inflammation with inhibitors of basement membrane degradation. Immunol Cell Biol. 76: 104-113. Sasaki, N., N. Higashi, T. Taka, M. Nakajima, T. Irimura. 2004. Cell surface localization of heparanase on macrophages regulates degradation of extracellular matrix heparan sulfate. J. Immunol. 172: 3830-3835. Verbovetski, I., H. Bychkov, U. Trahtemberg, I. Shapira, M. Hareuveni, O. Ben-Tal, I. Kutikov, O. Gill, D. Mevorach. 2002. Opsonization of apoptotic cells by autologous iC3b facilitates clearance by immature dendritic cells, down-regulates DR and CD86, and up-regulates CC chemokine receptor 7. J. Exp. Med. 196: 1553-1561. Zetser, A., F. Levy-Adam, V. Kaplan, S. Gingis-Velitski, Y. Bashenko, S. Schubert, M. Y. Flugelman, I. Vlodavsky, N. Ilan. 2004. Processing and activation of latent heparanase occurs in lysosomes. J. Cell Sci. 117: 2249-2258. Vlodavsky, I.. 1999. Preparation of extracellular matrices produced by cultured corneal endothelial and PF-HR9 andodermal cells. J. S. Bonifacino, and M. Dasso, and J. B. Harford, and J. Lippincott-Schwartz, and K. M. Yamada, eds. Current Protocols in Cell Biology 10.4.1-10.4.14. Wiley & Sons, New York. Vlodavsky, I., Z. Fuks, M. Bar-Ner, Y. Ariav, V. Schirrmacher. 1983. Lymphoma cell-mediated degradation of sulfated proteoglycans in the subendothelial extracellular matrix: relationship to tumor cell metastasis. Cancer Res. 43: 2704-2711. Blaecke, A., Y. Delneste, N. Herbault, P. Jeannin, J. Y. Bonnefoy, A. Beck, J. P. Aubry. 2002. Measurement of nuclear factor-κB translocation on lipopolysaccharide-activated human dendritic cells by confocal microscopy and flow cytometry. Cytometry 48: 71-79. Goldshmidt, O., E. Zcharia, R. Abramovitch, S. Metzger, H. Aingorn, Y. Friedmann, V. Schirrmacher, E. Mitrani, I. Vlodavsky. 2002. Cell surface expression and secretion of heparanase markedly promote tumor angiogenesis and metastasis. Proc. Natl. Acad. Sci. USA 99: 10031-10036. Levy-Adam, F., H. Q. Miao, R. L. Heinrikson, I. Vlodavsky, N. Ilan. 2003. Heterodimer formation is essential for heparanase enzymatic activity. Biochem. Biophys. Res. Commun. 308: 885-891. Goldshmidt, O., E. Zcharia, H. Aingorn, Z. Guatta-Rangini, R. Atzmon, I. Michal, I. Pecker, E. Mitrani, I. Vlodavsky. 2001. Expression pattern and secretion of human and chicken heparanase are determined by their signal peptide sequence. J. Biol. Chem. 276: 29178-29187. Naggi, A., B. Casu, M. Perez, G. Torri, G. Cassinelli, S. Penco, C. Pisano, G. Giannini, R. Ishai-Michaeli, I. Vlodavsky. 2005. Modulation of the heparanase-inhibiting activity of heparin through selective desulfation, graded N-acetylation, and glycol splitting. J. Biol. Chem. 280: 12103-12113. Vlodavsky, I., M. Mohsen, O. Lider, C. M. Svahn, H. P. Ekre, M. Vigoda, R. Ishai-Michaeli, T. Peretz. 1994. 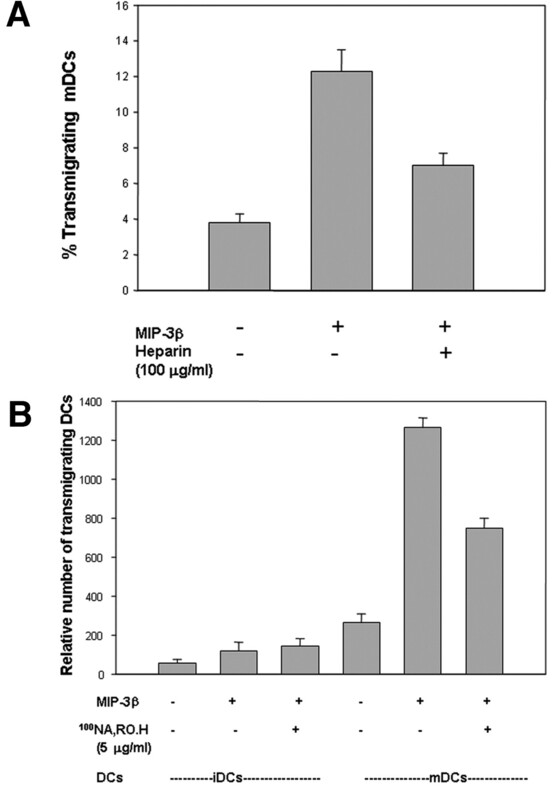 Inhibition of tumor metastasis by heparanase inhibiting species of heparin. Invasion Metastasis 14: 290-302. Bar-Ner, M., M. Mayer, V. Schirrmacher, I. Vlodavsky. 1986. Involvement of both heparanase and plasminogen activator in lymphoma cell-mediated degradation of heparan sulfate in the subendothelial extracellular matrix. J. Cell. Physiol. 128: 299-306. Fridman, R., O. Lider, Y. Naparstek, Z. Fuks, I. Vlodavsky, I. R. Cohen. 1987. Soluble antigen induces T lymphocytes to secrete an endoglycosidase that degrades the heparan sulfate moiety of subendothelial extracellular matrix. J. Cell. Physiol. 130: 85-92. Vaday, G. G., O. Lider. 2000. Extracellular matrix moieties, cytokines, and enzymes: dynamic effects on immune cell behavior and inflammation. J. Leukocyte Biol. 67: 149-159. Gingis-Velitski, S., A. Zetser, V. Kaplan, O. Ben-Zaken, E. Cohen, F. Levy-Adam, Y. Bashenko, M. Y. Flugelman, I. Vlodavsky, N. Ilan. 2004. Heparanase uptake is mediated by cell membrane heparan sulfate proteoglycans. J. Biol. Chem. 279: 44084-44092. Lider, O., Y. A. Mekori, T. Miller, R. Bar-Tana, I. Vlodavsky, E. Baharav, I. R. Cohen, Y. Naparstek. 1990. Inhibition of T lymphocyte heparanase by heparin prevents T cell migration and T cell-mediated immunity. Eur. J. Immunol. 20: 493-499. Bernard, D., B. Mehul, C. Delattre, L. Simonetti, A. Thomas-Collignon, R. Schmidt. 2001. Purification and characterization of the endoglycosidase heparanase 1 from human plantar stratum corneum: a key enzyme in epidermal physiology?. J. Invest. Dermatol. 117: 1266-1273. Fairbanks, M. B., A. M. Mildner, J. W. Leone, G. S. Cavey, W. R. Mathews, R. F. Drong, J. L. Slightom, M. J. Bienkowski, C. W. Smith, C. A. Bannow, et al 1999. Processing of the human heparanase precursor and evidence that the active enzyme is a heterodimer. J. Biol. Chem. 274: 29587-29590. McKenzie, E., K. Young, M. Hircock, J. Bennett, M. Bhaman, R. Felix, P. Turner, A. Stamps, D. McMillan, G. Saville, et al 2003. Biochemical characterization of the active heterodimer form of human heparanase (Hpa1) protein expressed in insect cells. Biochem. J. 373: 423-435. Yanagihara, S., E. Komura, J. Nagafune, H. Watarai, Y. Yamaguchi. 1998. EBI1/CCR7 is a new member of dendritic cell chemokine receptor that is up-regulated upon maturation. J. Immunol. 161: 3096-3102. Sallusto, F., P. Schaerli, P. Loetscher, C. Schaniel, D. Lenig, C. R. Mackay, S. Qin, A. Lanzavecchia. 1998. Rapid and coordinated switch in chemokine receptor expression during dendritic cell maturation. Eur. J. Immunol. 28: 2760-2769. D’Amico, G., G. Bianchi, S. Bernasconi, L. Bersani, L. Piemonti, S. Sozzani, A. Mantovani, P. Allavena. 1998. Adhesion, transendothelial migration, and reverse transmigration of in vitro cultured dendritic cells. Blood 92: 207-214. Schubert, S. Y., N. Ilan, M. Shushy, O. Ben-Izhak, I. Vlodavsky, O. Goldshmidt. 2004. Human heparanase nuclear localization and enzymatic activity. Lab. Invest. 84: 535-544. Takaoka, M., Y. Naomoto, T. Ohkawa, H. Uetsuka, Y. Shirakawa, F. Uno, T. Fujiwara, M. Gunduz, H. Nagatsuka, M. Nakajima, et al 2003. Heparanase expression correlates with invasion and poor prognosis in gastric cancers. Lab. Invest. 83: 613-622.